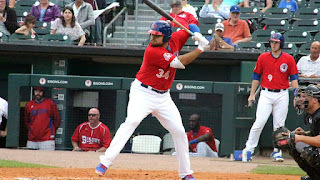 CHARLOTTE, N.C. -- The Bisons benefitted from an early lead and broke out the brooms as they completed a three-game sweep with a 4-2 win over the Knights Wednesday night from BB&T Ballpark. The Herd offense exploded for 14 runs Tuesday night and Buffalo didn't skip a beat on Wednesday. By the end of the second inning, the Bisons staked a claim to a four-run lead thanks to early production at the plate. Fresh off a two-home run game, Rowdy Tellez kept his hot streak alive. In the first, he beat the shift and singled to left to score Dwight Smith Jr. for the game's first run. Billy McKinney parlayed his momentum from the last two games with a solo shot in the second over the short porch in right field - his third home run of the series. Then, Jonathan Davis knocked in Michael De La Cruz on a double after the catcher tripled and Smith Jr. singled to move the score to 4-0. The Knights sliced the deficit in half but that's all Charlotte was able to scratch across. Jose Fernandez pitched a hitless eighth. Then, with two outs in the ninth, Justin Shafer faced power-hitting outfielder and White Sox top prospect Eloy Jimenez, who represented the tying run. The closer fell behind in the count but recovered by inducing a pop out to promptly end the game. Southpaw starter Matt Tracy took the mound searching for the ever so elusive first Triple-A win of the season and pitching with run support, he was able to notch the victory. Against the Knights, Tracy logged five scoreless innings while striking out a season-high six batters. He has now gone five or more innings in all eight of his Triple-A starts this season. Tracy put runners on the corners with no outs in the second but escaped the jam himself by fielding a light groundball and throwing it to first to end the inning. The rest of his start was smooth sailing as he helped the Bisons earn the victory in the series finale.